These UV Sterilization Cabinets provide a convenient area for setting up PCR reactions in a nucleic acid free environment thus limiting PCR reaction contamination. Acting effectively as a low cost alternative to a clean room, the powerful UV lights on the cabinets denature nucleic acids in 5 to 30 minutes making them unsuitable for amplification. The cabinet incorporates safety features to prevent user exposure to UV light. The UV lights themselves are timer controlled and there are safety switches on the cabinets doors which turn off the UV lights when opened. The cabinets also act as an efficient shield of beta radioactive emissions and can therefore be safely used with isotopes such as 32P. The white light provides excellent visibility when working within the cabinets. For use with trays of size 68 x 54cm, CSR-TW4/TY4/TL4. 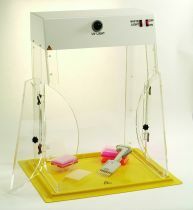 The new Mini UV Cabinet has been designed for limited budget and space requirements.